Another week, another pound. Life is good. My repeating message seems to be that it’s getting easier as it gets more difficult – and if I had better flexibility, perhaps some things wouldn’t be as painful. I still can’t touch my toes and although I spend a good 10 minutes in the sauna doing stretches before each workout, there are certain positions I just cannot bend myself into. On the other hand, I’m definitely more limber than I have been in 30 years, so I suppose I’m progressing… Patience is not always one of my virtues. We picked up some fresh beets at the produce store the other day and they had some pretty spectacular greens attached. I must admit that most of the time when I buy beets at the local grocery store, the greens look pretty sad and I just cut them off and toss them when I get home. Tonight, I chopped them and then blanched them in boiling salted water and then plunged them into ice water. From there, I sauteed leeks and garlic in a bit of olive oil, and added the greens along with some blackberry balsamic vinegar. A bit of salt and pepper, and onto the plate they went. 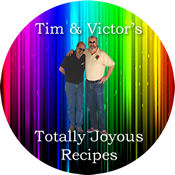 They were topped with a grilled pork tenderloin and sweet potatoes on the side. It’s now on to week forty. Three more months to go. Will I be touching my toes by then?! ?